Connecticut’s Exports Continue to Take Off! 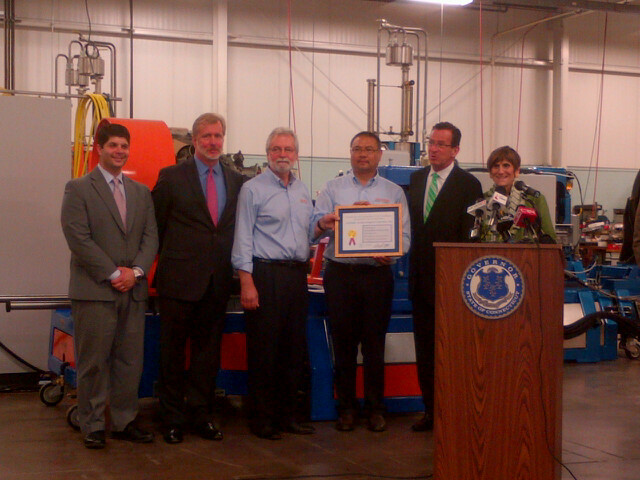 Connecticut small business Test Logic Inc. received an Export Achievement Certificate for its export success. It’s a great time to be a Connecticuter! Connecticut as a whole has been a wealth of exports as its merchandise shipments totaled $16 billion in 2012, which is an increase of about 9 percent since 2009. Small businesses have helped lead the way in this increase. Of the 6,020 companies that exported from The Constitution State in 2011, more than 5,300 were small and medium-sized companies employing fewer than 500 workers. With numbers like that it is easy to see why Connecticut Governor Dannell Malloy signed the Export Financing Act last week. The Commissioner of Economic Development will now have the ability to give priority funding to small businesses wishing to export their product under Connecticut’s Small Business Express Program. This bill shows how committed Connecticut is to being a major player in the global economy and its strong commitment to small business. The bill sets up a brilliant future for Connecticut’s small businesses who aren’t yet exporting, so they can join their fellow business leaders in seeing the boost exporting can give to their bottom line. For example, Test Logic Inc. was awarded with an Export Achievement Certificate for its outstanding success in exporting their products. The award was given by Acting Deputy Under Secretary of Commerce for International Trade Ken Hyatt and Connecticut Congresswoman Rosa DeLauro. Based out of Middletown, Test Logic is a small business of only 17 employees specializing in designing, manufacturing, and producing highly sophisticated, custom built-to-order aerospace test equipment used to develop turbine engines. It has become one of the leading providers in complete test cell system packages for multiple major aerospace companies, both foreign and domestic. Test Logic consulted with the Connecticut U.S. Export Assistance Center to help get their exports off the ground. The team helped the company take advantage of SBA financing programs which eventually led to the company acquiring an $850,000 SBA Export Working Capital Loan. All this has helped Test Logic to expand to new markets like Japan, Australia, and the United Kingdom. Now, 75 percent of the company’s revenue come from exports. As a born and raised Nutmegger, I am very proud in what small businesses like Test Logic are doing to propel not only Connecticut’s economy, but to support our national recovery also. I’m glad to know the state is helping support small businesses as they lead the way in the global market. As President Obama has said, small businesses are the backbone of our country. They may be small, but they deliver the powerful punch that is needed to stimulate our national and state economies. Way to go, Connecticut! You’re paving the way and providing the tools for all small businesses to succeed overseas.